A visual workplace is a self-ordering, self-explanatory, self-regulating and self-improving work environment – where what is supposed to happen does happen, on time, every time, 24/7. 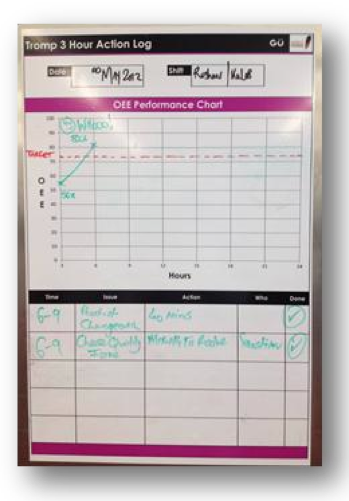 Visual management is used to display and monitor the key performance measures that guide improvement. It allows teams to understand immediately how a process is performing, without the need to stop or leave the workplace. Team members are kept aware of current quality, cost and safety performance and can use their input to suggest improvements. The use of a visual workplace builds a team ethos and generates ownership of tasks, ensuring everyone shares a common understanding and remains focused on the key areas. As decisions are made more effectively and communicated quickly working time is also used to greater advantage. 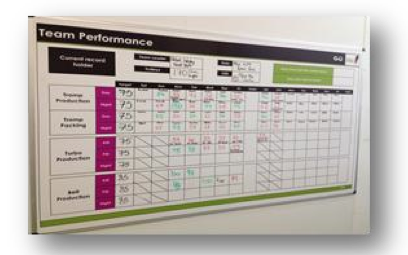 In addition, reviewing performance in this way makes it easier to track progress and thereby establish and embed a continuous improvement culture. The intention is that problems are solved at the lowest level rather than referred up. Many successful organisations use this as key Lean tool to drive improvement and engagement. Motion is moving without working1. It is the corporate enemy since when people are in motion they are away from the area in which they add value. Basing the visual tools and functions around these two questions creates a visual workplace which is effective and efficient. Coriolis has worked with clients to install a range of Visual Functions on production sites across the UK and abroad. Visual displays and Visual Metrics were designed and installed to enable team members to understand a situation at a single glance, make decisions and take actions. Too many companies treat shop floor data as something that is collected to be analysed later, this is a great lost opportunity. 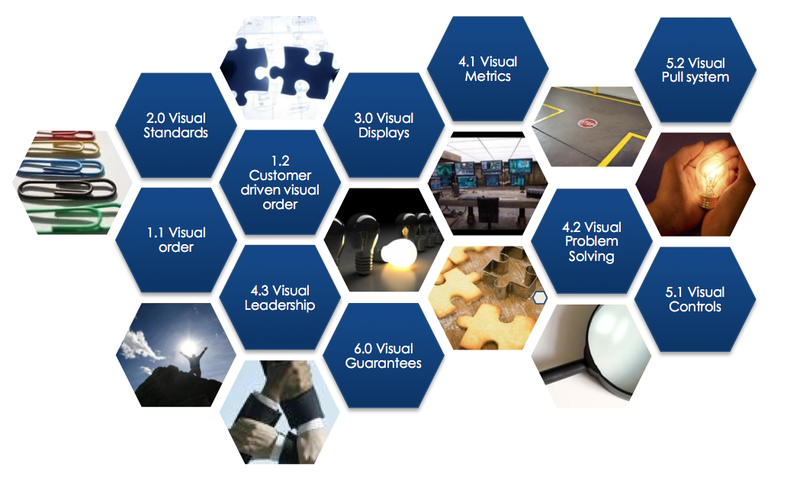 Visual metrics monitor current performance (short interval control) and report back – provoking a response to drive instantaneous corrective action. Their immediacy and proximity to the shop floor is invaluable in identifying root cause in a way that data analysis can never achieve. Morning and evening shift reviews were installed on site, in which the previous shift’s performance and downtimes’ were discussed. Fig. 3 shows the main performance board. A performance management system (MiMo), designed by Coriolis, was installed on site to provide live performance data for each production line. Fig. 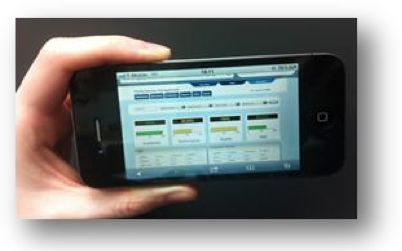 4 illustrates how the software can be remotely accessed to provide live data 24/7. The information was updated every three hours (other options, including continuous data capture are also available) and if there was any deviation from the set performance target, action was taken immediately, rather than reviewing the problem the next day – when it is too late. Fig. 5 demonstrates an example of visual metrics being used on the line side. This tool highlighted to the line crew when performance was below target. Text boxes were present for operatives to record the cause for the poor performance and whether it had been resolved. Visual controls require little or no interpretation – the device is the message. They help people do ordinary things extraordinarily well, visually answering the quantity based core questions; how many or how much, when or how long. They use structure to share information and become more powerful when linked with other visual controls, for example those related to material replenishment and flow. When linked they can trigger a chain of responses. The first step to take was to create visual order so that each item has its’ place. 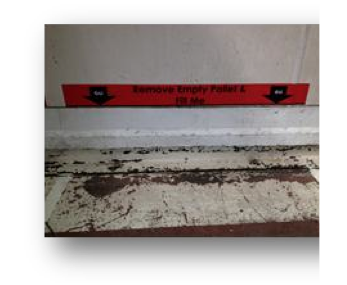 This involved setting out boundaries and location ID’s in the material decant corridor (see fig 7). ￼Asking the two core questions “What do I need to know? And “What do I need to share?” enabled suitable Kanban and Two Bin systems to be designed and installed. As a result materials were pulled through the system rather than pushed. When materials were running low or a required for a changeover, operators were warned in good time and downtime ‘waiting for materials’ was eliminated. Creating a fully functional visual workplace rarely works first time. It is a combination of: Methodology and Inventiveness. Focus on one area initially to install visual systems and make an “area of excellence” for the rest of the organisation to follow using the two questions stated at the start and the six visual categories, The success of the pilot will dictate the success of the whole programme so make sure you get it right before you move on, and involve someone you know has succeeded with it before. NPD…why are Products Failing to hit their targets..? With few exceptions, perhaps 57, new products are the life blood of any food company. The challenge is to develop profitable, creative products for some of the most demanding customers in the world; British retailers. The marketplace is on a constant drive for products that are better value, have a reduced environmental impact, provide improved customer experiences, meet ever changing consumer trends and, through extended life, provide reduced waste. This task of satisfying these requirements falls to the NPD department and its process development colleagues. Businesses vary, but the annual product churn is typically between 5 and 100 products, or to look at it another way, between 12% and 50%. Food manufacturers typically work in a profit range between 3% and 20%, with the vast majority falling below 10%. As products become commoditised, so margins tend to erode, and understanding why new products so often fail to hit their expected financial recoveries is critical to business success. When we speak to financial and manufacturing managers, they generally say that new products either hit their financial recoveries in one to six weeks or never hit them at all. It is estimated more than 20% of all manufacturers product portfolio’s never hit their costed standard. So why are products failing to hit their targets? The first step in developing an effective process is to establish the real value of existing products. For each product manufactured an accurate financial picture should be defined. Many businesses are unaware which products actually yield the biggest financial returns. As a result the development team, however well managed or furnished with market data, may develop products that sell but make little profit. Typically products are costed on a percentage basis but in a capacity-constrained businesses it is not the percentage contribution that is critical but the contribution per hour. For example a product that sells for £3 with a 15% margin running at the same speed as a product that sells for £1 with a 25% margin would deliver more cash to the bottom line per running minute. With good data for creating new product concepts businesses can get on the front foot, continually developing new products the factory is capable of making and holding a catalogue of de-risked products they can select and present at the tender stage. As they have looked for margin growth, retailers have increased the frequency of tendering business which has resulted in manufacturers needing to develop products at short notice. Rushing costings and trials significantly increases the risk of error, and having a robust process is critical to managing this risk. The last thing a business wants to win is a product it will make at a loss because the costing was wrong. 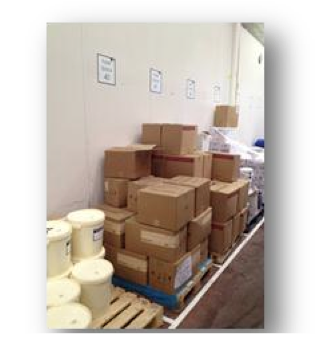 For one of our clients the time to get a new product from concept to launch using existing processes is 8 to 12 weeks. Achieving nutritional data, packaging designs, ensuring shelf life expectancy and running factory trials was seen as “tight” and due to the rush the businesses did not fully evaluate the capital payback and the cost of development to launch. If armed with all the facts some of its products would never have left the test kitchen. However, there are elements of the process that could be shortened or removed altogether allowing time for the important initial decisions to be made. Labour requirements for new products can be modelled using existing processes. 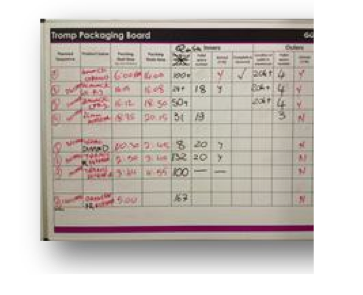 It is good practice to have a standards data base covering every shop floor activity, both direct and indirect including areas such as de-boxing and goods inward, often missed in labour cost modelling. 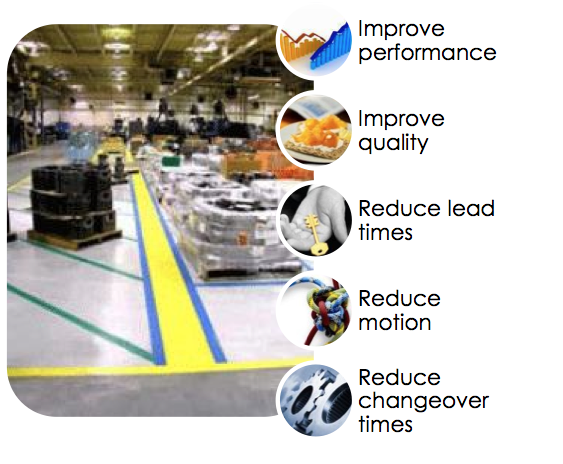 Once the standards have been established for all factory activities a labour cost model can be developed for any new product while it is still in the test kitchen, including realistic line diagrams and run speeds. In manufacturing processes that are static from one year to the next, mass balance studies should be carried out on products that represent the overall portfolio, keeping template information fresh and allowing a full costing model of any product before the day of launch. In a survey we carried out, both operations and financial managers reported that data established during factory trials was unreliable. It is not romantic or exciting, but NPD time is often better spent developing robust trials for the few products with real prospects of success than working on the next new concept. Post launch reviews were reported as being “sporadic” or “an opportunity to assign blame for what went wrong”. Many reviews focus on documenting the mistakes and responsibilities, but the only value of these meetings is in identifying the root causes and eliminating or mitigating them. It is not a sin to make a mistake, but it is one to repeat it perfectly. The cost of getting NPD wrong is potentially enormous, as is the opportunity for profit. Any business with a significant need for new products should regularly and critically review its NPD process. If you can’t see a way of improving it, you’re probably not looking. Share "NPD…why are Products Failing to hit their targets..?" Risk Management within the Food Industry: How risk proof is your supply chain? What is risk? Risk is the possibility that an event will occur which leads to an undesirable outcome. Risk management is the identification, assessment and prioritisation of risks followed by the coordinated and economical application of resources to minimize, monitor, and control the probability and/or impact of unfortunate events. There are numerous examples of businesses which believed they managed risk, but could not mitigate the effects of predictable events. 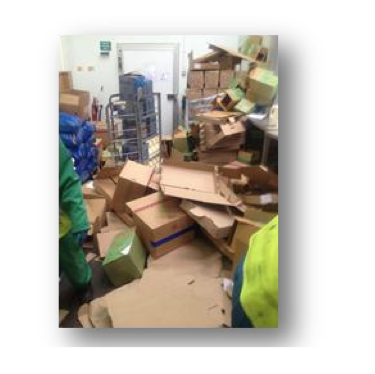 Recently, as a result of logistical issues, a major chilled food client ran out of a key ingredient. The result was not just a reduction in profit, but more importantly the loss of credibility with a strategically important customer. Not untypically they put in place actions to ensure that, should the same problem recur, they would be ready. This is reactive management but it is not risk management. Risk management is defined by the ability to deal with events that have not previously occurred. Figure 1.0 (above) shows categories of risk that every business should address. Few would argue with these, yet few seriously address them. What, for example, does the FT tell us on the 31st July? How many businesses are ready for this? Is this a one-off? Perhaps you remember that two years ago Russia imposed an export ban on wheat which sent prices soaring. It may not be the same risk, but it is the same type. Ultimately, ignoring supply chain risks increases cost. This summer, R&R Ice Cream recalled three of its Tesco products. The costs associated with the problem, fines, reverse logistics, disposals and lost margin, are just the start. They have risked their reputation and their brand. They have risked their future. 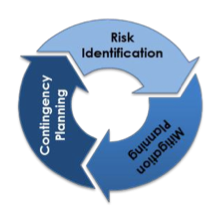 As was said earlier, risk management is about identification, mitigation and contingency planning. Done properly, the cost of doing it is less that the cost of avoiding it. To finish on a positive note: Carr’s Flour Mills have announced a £17m factory build in Kirkcaldy. This will both secure wheat supplies and enable them to place orders when prices are favourable. Their customers value the security and cost stability. The business can operate with confidence, focusing on their strategic goals. Share "Risk Management within the Food Industry: How risk proof is your supply chain?" Coriolis-led expansion project enables Dairy Crest to deliver great service. The chilly commercial climate is no barrier to future focussed growth investment for Dairy Crest. The company recently selected Nottingham based global management consultancy Coriolis as the perfect partners to manage a pivotal £3.1 million capital investment project for their Foston dairy facility. The project was finished on time and 10% under budget, making it yet another sparkling success for Coriolis and adding to their proven track record of providing solutions in operational excellence, supply chain and capital project management for the food industry. Coriolis Project Director Mike Roberts says “We had to deliver the extension within 24 weeks in a live factory environment – a real challenge. We completed on time and 10% under budget, giving Dairy Crest the time to fulfil their commitment to major retailers.” The detailed technical specifications of the expansion demanded careful planning and accurate delivery. Work carried out: Addition of 5 internal loading bays, two external loading bays, access road, 8,700 sq ft trolley yard, overhead trolley system, provision for two further external loading bays. Technical installations: State-of-the art cooling system to keep temperature sensitive products between 3 and 5 degrees centigrade. Energy conserving lighting and motion sensors. Advanced fire detection system. Capacity provision: Took on-site pick volumes to 250 million litres per annum. Met Tesco operating specifications and peak Christmas requirements. ￼Site sensitivity: Project completed on a ‘live’ site without disruption to functionality and impact on existing business. Dairy Crest undertook the project as part of a phased expansion plan that will see the plant reaching pick volumes of up to 440 million litres per annum. Coriolis’ delivery and vision has ensured capacity for medium term growth and an exceptional return on capital investment. For more information, images, interviews or quotes from Coriolis please contact Maria Ferrara, Marketing Coordinator on +44 (0)8452 263 364, email maria.ferrara@coriolis.co.uk, or visit www.coriolis.co.uk. Share "Bringing business growth in from the cold"